Window graphics are a form of outdoor business signage that helps to grab the attention of people walking and driving past! One of the most important elements of a successful business is promotion and advertising. If you don’t promote your business, no one is going to know about it and you won’t gain the proper business exposure. Business signage is a great advertising tool and there are so many kinds to choose from to meet your specific needs. Here are five common types of business signage to help make your decision easier! 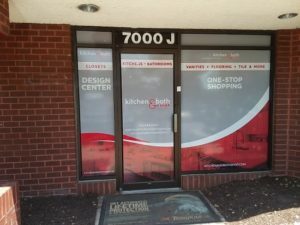 If your goal is to get more people to come into your place of business, then outdoor business signage is a great option. The biggest challenge for a lot of businesses is simply getting people in the door to see what they have to offer. Outdoor signage includes things like sidewalk signs, entrance signs, window graphics, and awnings. You want to place outdoor signage in places that have the most foot and drive-by traffic as possible. This type of business signage is used to make a guest’s experience easier when they come into your business. Informational signage is good for larger businesses that customers may have trouble navigating through. This includes directional signs, departmental signs, and wayfinding signs to help guide people through your store without getting lost. People love sales and persuasive signage is a great way to give customers an extra nudge into buying a product. Often times, persuasive signage is one that promotes a sale or current featured items. Putting these signs on display helps persuade customers to go towards the specialty items and brings attention to items that may have otherwise gone unnoticed. This is a more unconventional type of business signage, but it is still common. You’d be surprised how many people take notice of floor mats that are customized with business names or logos. This helps to promote safety and cleanliness while also increasing your brand awareness. Floor mats are typically placed at the entrance of a building, so it will be the first and last thing people see, leaving a lasting impression. Contact Brand It Wrap It Today for Your Business Signage! Our goal is to exceed your expectations and produce effective custom signage that helps you promote your company’s image, attracts new customers, delivers your message, and gives your corporate image a creative edge. Follow us on Facebook, Twitter, Google+, and Pinterest! This entry was posted on Friday, November 16th, 2018 at 4:54 pm. Both comments and pings are currently closed.